In Tamil-Nadu the temperature for ten out of the twelve months is incredibly hot, but for two months of the year – April and May – it rises to seriously unconfortable levels. In India, this is when the school holidays fall. During what the Tamailse call the “kathiri veyil” (the hottest days of the year), the children at the Shanthi Bhavan Children’s Home, who are already physically weak, really struggle in the harsh conditions. 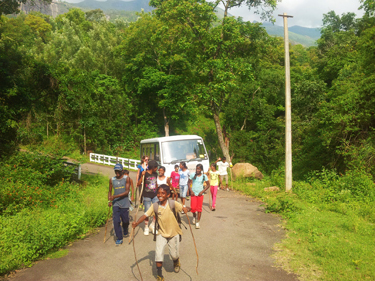 To escape the crushing coastal heat, we take the children to the mountains for two weeks every year. 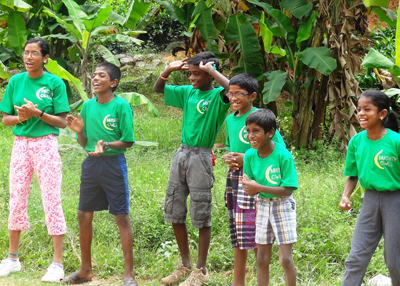 As well as the fresh air, these trips provide the children with many positive experiences and physical benefits. The summer camps are an opportune moment to increase the familial climate between the children and instructors. They are also a great opportunity to better get to know one another and to make new discoveries of all kinds: walking, swimming, games, fishing, etc. In 2016 the camp was financed by donations from individual donors. In 2017, the necessary funds were raised thanks to a crowdfunding campaign in partnership with MYGALOO and also thanks to the students of the High School Montaigne in Paris, who raised €2 790, and LILO, which raised €156. The cost for 56 children to attend the mountain camp for two weeks in the summer of 2018 will be €4 000.